WHAT: “Energize the Vets” fundraising luncheon with guest speaker Marianne Williamson, internationally acclaimed author and lecturer. Red carpet arrivals, silent auction, raffle, holistic products. Purpose: proceeds go to providing free holistic and alternative recovery services to veterans traumatized by war. WHEN: Saturday, October 17, 2015 11:30 A.M to 4:00 P.M.
WHY: American military veterans return from war zones with physical, mental, emotional illnesses including post-traumatic stress syndrome (PTSD). Currently, there is a wait to receive treatment at the Veteran’s Administration Hospital (VA). 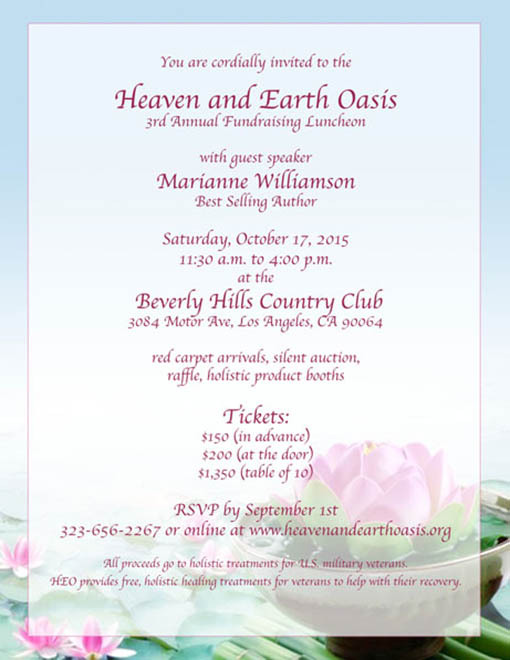 Heaven and Earth Oasis, a nonprofit 501 (c) (3), was formed in Los Angeles to address the widespread need for immediate help by offering a peaceful, safe, holistic healing space and multiple, effective alternative treatments with top professionals provided free of charge to veterans via donations. Alternative healing methods are recognized and used by the VA as a protocol for treating numerous health issues. Heaven and Earth Oasis provides a complete array of customized holistic healing treatments by certified therapists free of charge to veterans to help with their recovery.